First it was the anti-establishment Five Star Movement, led by charismatic comedian Beppe Grillo, that shook up Italy's political landscape. Now a new populist movement headed by disgruntled farmers and lorry drivers has taken its anti-austerity message to Italy's streets and squares. The past week has seen four days of rallies and protest actions across the country by the Forconi, or "Pitchforks". The name derives from the movement's roots among struggling farmers in Sicily, who in 2011 and 2012 staged strikes and roadblocks to demand more help from the government. The loose-knit grouping has expanded nationwide and has drawn in a variety of groups who have suffered badly as Italy's economic crisis has dragged on. The protesters include road hauliers, small businessmen, low-paid workers, the unemployed and students. Some of the protesters complain of excessive state regulation and are unhappy about austerity-driven tax hikes. Others have denounced capitalism and the euro. All seem to be united in their contempt for Italy's politicians, who are accused of failing to address the country's grave economic problems. Demonstrations spread across the country after they began on Monday, with major northern cities including Milan, Turin and Genoa showing the biggest turnouts. Turin saw some of the angriest protests, with police using tear gas to disperse protesters, who blocked rail traffic at the city's main stations before heading to the main office of the Italian tax collection agency, Equitalia. Demonstrators later sought to block a border crossing between France and Italy. Riot police moved in to disperse them. Protests also caused disruption in the northern regions of Veneto and Emilia Romagna, and in Puglia and Sicily in the south. The Italian government on Thursday expressed its concern and Interior Minister Angelino Alfano warned of the danger of a "drift into rebellion" by the movement. He spoke of the protests drawing in elements bent on violence. "There is a violent face (to the movement) that has broken the law: we understand the social unease, but at the same time we do not have any hesitation in saying that we intend to defend the liberty and security of citizens," Mr Alfano told parliament. In Sicily, one of the protest leaders, Mariano Ferro, said it was unfortunate that some rallies elsewhere in the country had descended into violence, and he blamed right-wing elements for the trouble. "We are a movement of farmers and lorry drivers who have been calling for years for government intervention against the social hardships wrought by the recession," Mr Ferro said. "Unfortunately our movement is being associated with hooligans and subversives. We have nothing to do with them and we vehemently dissociate ourselves from the violence occurring in other parts of our country," he told Italy's Ansa news agency. Giorgio Bissoli, a spokesman for the Azione Rurale protest group in the Veneto region, told Canale 5 television: "We farmers are on the streets to say 'Enough!' to the state, the government, the unions. We just can't manage anymore." Danilo Calvani, a farmer who has also emerged as a protest leader, said "there are millions of us and we are growing by the hour - this government has to go". Italian Prime Minister Enrico Letta, whose left-right coalition government won a confidence vote in parliament this week, condemned comments by Five Star Movement leader Beppe Grillo, who called on police to stop protecting politicians and join the Forconi protests. 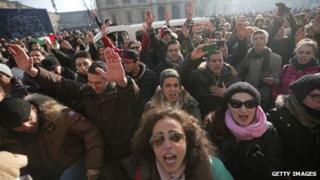 Mr Grillo's call came after police in a number of locations where protests had been quelled took off their riot helmets. Pictures of the helmet-less police standing in front of protesters were widely carried by Italian media, and many, including Mr Grillo, interpreted the gesture as police showing solidarity with the demonstrators. Mr Letta rejected that interpretation and criticised Mr Grillo, saying his declarations "tear apart representative democracy and incite insubordination". Five Star caused a political earthquake by winning a quarter of the vote in parliamentary elections in February. While the movement does not have formal ties with the Forconi, both want a radical shake-up of the country's politics. The current protests have underlined ongoing public anger over government policies aimed at trying to improve Italy's public finances and keep them within European Union rules. But Prime Minister Letta has promised to persevere with reforms and fight "populism". "We will not allow Italy to sink again," he said, promising to "fight with everything I have to avoid our country being thrown back into chaos just as it is beginning to lift itself up again".